In similar company with new-school French progressive dance artists such as Motorbass, Air, Cassius, and Dimitri from Paris, Parisian duo Daft Punk quickly rose to acclaim by adapting a love for first-wave acid house and techno to their younger roots in pop, indie rock, and hip-hop. The combined talents of DJs Guy-Manuel de Homem-Christo and Thomas Bangalter, the pair's first projects together included Darling, a voiceless indie cover band; their current recording name derives from a review in U.K. music weekly Melody Maker of a compilation tape Darling were featured on, released by Krautrock revivalists Stereolab (their lo-fi D.I.Y. cover of a Beach Boys song was derided as "daft punk"). Subsequently ditching the almost inevitable creative cul-de-sac of rock for the more appealing rush of the dancefloor, the pair released their debut single, "The New Wave," in 1993 on the celebrated Soma label. Instantly hailed by the dance music press as the work of a new breed of house innovators, the single was followed by "Da Funk," the band's first true hit (the record sold 30,000 copies worldwide and saw thorough rinsings by everyone from Kris Needs to the Chemical Brothers). Although the group had only released a trio of singles ("The New Wave" and "Da Funk," as well as the 1996 limited pressing of "Musique"), in early 1996 Daft Punk were the subject of a minor bidding war. The group eventually signed with Virgin, with its first long-player, Homework, appearing early the following year (a brief preview of the album, "Musique," was also featured on the Virgin compilation Wipeout XL next to tracks from Photek, Future Sound of London, the Chemical Brothers, and Source Direct). As with the earlier singles, the group's sound is a brazen, dancefloor-oriented blend of progressive house, funk, electro, and techno, with sprinklings of hip-hop-styled breakbeats and excessive, crowd-firing samples similar to other anthemic dance-fusion acts such as the Chemical Brothers and Monkey Mafia. In addition to his role in Daft Punk, Bangalter operates the Roulé label and has recorded under his own name (the underground smash "Trax on da Rocks") as well as Stardust (the huge club/commercial hit "Music Sounds Better with You"). After four long years of fans eagerly awaiting a follow-up to their brilliant debut, Daft Punk finally issued Discovery in March 2001. The live record Alive 1997 followed at the end of the year, and a by-now predictable four-year wait preceded the release of Human After All in early 2005. One year later, Daft Punk released a compilation, Musique, Vol. 1: 1993-2005, and in 2007 their second live record, Alive 2007, arrived. The album and its single "Harder, Better, Faster, Stronger" won Grammy Awards early in 2009; shortly after, it was announced that the duo would compose the soundtrack to Tron: Legacy, the sequel to the 1982 classic sci-fi film Tron. Daft Punk's music for the movie was released in November 2010, shortly before the film -- which featured the group in a cameo -- arrived in theaters. 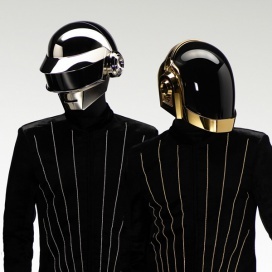 Early in 2013, Daft Punk announced that they planned to have a new album released by May of that year. That March, the duo announced the album's title, Random Access Memories, and launched an extensive press campaign that featured snippets of the album's lead single, "Get Lucky," and interviews with some of their collaborators, which included Nile Rodgers, Paul Williams, Giorgio Moroder, and Panda Bear. The single was officially released in April, and Random Access Memories arrived in May.